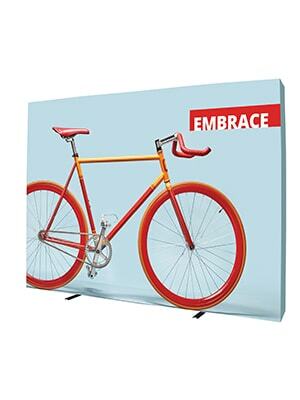 Embrace is a new innovative fabric SEG pop up system with it's unique design offering a sleek, collapsible display that delivers style and substance with minimal effort. Purpose made SEG textile graphics hug the frame to create a crisp, clean back wall, whether you are using a stand-alone frame or take advantage of the systems flexibility by joining multiple frames together to create a straight wall or a seamless 90 degree corner. The embrace is the connoisseurs choice for elegant back walls ideal for photography shoots, exhibition back drops or any retail solution.